This week, leading up to Easter, tens of thousands are expected to make their way into a soccer stadium in the forgotten city of Cúcuta, Colombia, to attend the Festival of Hope (Festival de Esperanza) with Franklin Graham. “I’ll be preaching about God’s love and forgiveness to the people not only of Colombia, but people from Venezuela who have come across the border,” Franklin Graham shared on Facebook. 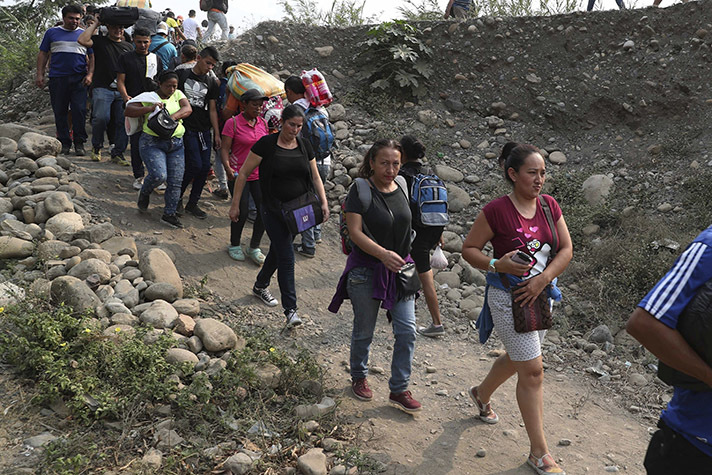 Less than four miles from Venezuela’s border, Franklin will preach words of life to some who are hungry, without jobs or wearing the only set of clothing they own. Facing economic and political crisis, these people will come for the name of the Festival itself: hope. While preparing for the Festival over the past few months, he’s witnessed the impact of the Venezuela crisis and its affect on the people of Cúcuta. Walking along the streets of Cúcuta, he can often tell who’s Venezuelan just by their physique—many have lost a lot of weight due to hunger. Cúcuteños are also facing their own battles of “violence, contrabands and narco-trafficking,” said local pastor Jorge Rojas, who’s been working alongside Swanson on Festival preparations. Originally from Bogotá, Rojas has called Cúcuta home for the past eight years, witnessing the city’s hardships and influx of migrants. “I want to make Jesus known throughout the people of the city,” he said. And for the first time, he’s seen its pastors and churches unite, with 340 churches participating in the Festival. “It’s a miracle that the body of Christ from many different denominations [in the city] are uniting for one cause,” he said, estimating 90 percent of the Cúcutas’ pastors are involved in the Festival. Two weeks ago, Swanson hopped into a taxi and headed to Cúcuta’s airport. Speaking with his taxi driver Mateo*, he brought up the Festival, just as he usually does when he takes a taxi. “Pretty much every time I mention the Festival, the driver will say, ‘I know all about that … I’m excited to be there,'” Swanson recalled. But this time, when Swanson mentioned “the event coming up Easter week,” the driver had no idea what he meant—glancing in the rearview mirror with a puzzled look in his eyes. As Swanson explained, Mateo’s eyes became misty, and a tear rolled down his face. “Am I offending you?” Swanson asked. He shook his head, chin quivering. Turning in his seat, he asked Swanson if it was OK to come to the Festival alone. You never have to be alone. Start a relationship with Christ today.